In a medium saucepan, bring the broth and water to a simmer. In a large pot, heat the oil over moderately low heat. Add the onion and cook, stirring occasionally, until translucent, about 5 minutes. Add the rice to the pot and stir until it begins to turn opaque, about 2 minutes. Add the wine and salt and cook, stirring frequently, until all the wine has been absorbed. Add about 1/2 cup of the simmering broth to the rice and cook, stirring frequently, until the broth has been completely absorbed. The rice and broth should bubble gently; adjust the heat as needed. Continue cooking the rice, adding broth 1/2 cup at a time and allowing the rice to absorb the broth before adding the next 1/2 cup. Cook the rice in this way until almost tender, about 20 minutes. Add the radicchio and parsley and cook until the radicchio and the rice are tender, about 5 minutes more. The broth that hasn't been absorbed should be thickened by the starch from the rice. You may not need to use all of the liquid, or you may need more broth or some water. Stir the pepper and the butter into the risotto. Add the mozzarella and stir until it melts into a web. 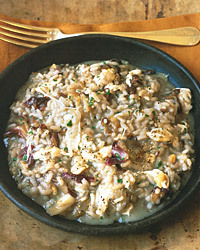 Here's a risotto that can stand up to red wine. Try an unoaked Barbera d'Alba, a lively and fruity wine whose very light tannins won't accentuate the bitterness of the radicchio.